Squadless takes a money-centric approach to preventing teen smoking, gets custom Twitter emoji. The anti-tobacco movement Truth is hitting young people in their pocketbooks with a new spot called Squadless that makes its TV debut during the MTV Video Music Awards on Sunday, August 28. Citing statistics that say smokers earn 20% less money than their smoke-free peers, the spot by 72andSunny features hapless teen smokers singing about being too broke to hang out with their "squad" – teen parlance for a group of friends. "It creates the ultimate FOMO experience," said Robin Koval, CEO and president at Truth Initiative. "We know that this generation of young people is very concerned about their finances, they're very concerned about financial independence. No surprise, they've come of age during the Great Recession." It’s notoriously difficult to get young people to care about their health - just ask any Obamacare enroller - so Truth has made a habit of tying tobacco use to issues with greater sway among teens. "Young people don't care about what's going to happen to them in 50 years - they care about what's going to affect them this weekend," said Mick DiMaria, group creative director at 72andSunny. "Earning money, getting a job, hanging with friends are all things they care about right now." In previous spots, Truth warned young people that smoking makes them less attractive on dating sites and doubles their pets’ risk of getting cancer. But lack of money comes in second only to school in a list of top teen complaints, according to research from the U.S. Tru Youth Monitor, an annual survey conducted by a subsidiary of the market insights firm Kantar. "Of course young people know that cigarettes are expensive," Koval said. 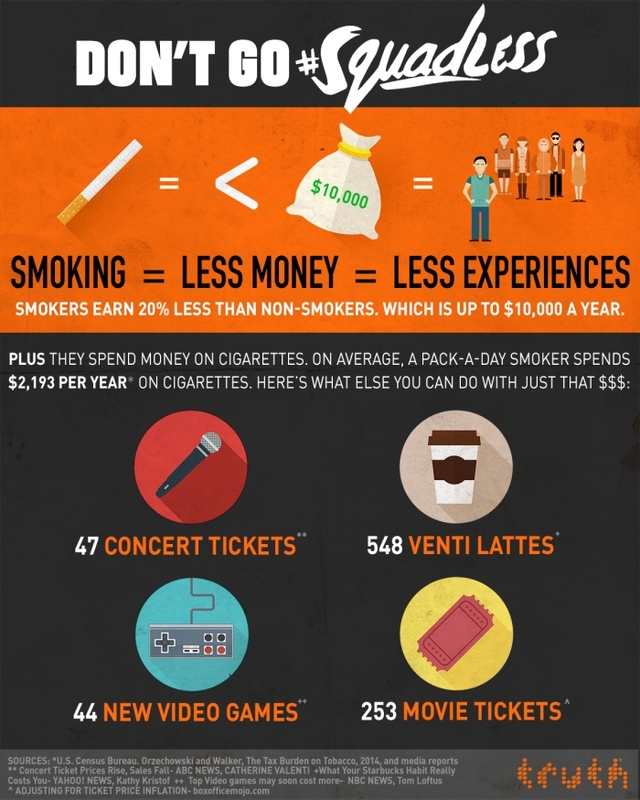 But Truth’s research found that 88% of 15-to-25-year-olds didn’t know smokers also made less money. Far from the typical "scared straight" approaches favored by many smoking-cessation or drug-abuse-prevention initiatives, Truth has been careful to focus on what teens can do to avoid the ugly consequences of smoking. "Scaring them doesn't work, like that lady with the hole in her throat in all those old ads," DiMaria said, "That just turns them off. What appeals to them now is telling them the truth and doing it in a way that doesn't pass judgement." It’s a strategy of empowerment, said Koval. "While there are many things that are hard to control in terms of your economic well-being, you can choose to be a smoker or not be a smoker." She added that Squadless has proved to be as successful during message testing as the #CATmageddon videos, a series of shorts postulating the horrors of a world without cats or internet videos featuring them. They ended up with 200 million combined video views across all platforms and 80,000 social media mentions, according to DiMaria. The message of empowerment, rather than fear, has been the driving force behind Truth’s messaging since the beginning of the Finish It campaign in 2014. While the teen smoking rate was 23% in 2000, it dropped to 9% by 2014 and stands at 7% now, a statistic Truth uses in an annual video congratulating young people for helping to prevent a new generation of smokers. It uses the tagline "Be the generation that ends smoking," encouraging viewers to "finish" the job. The campaign debuted at the 2014 VMAs, one of the few televised events that still draws large numbers of young people at the same time. The award show is a favorite placement for Truth. 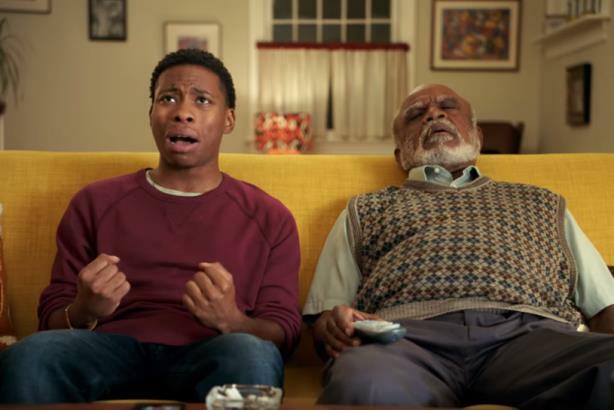 In 2015, the organization released "It’s a Trap," an ad focused on social smoking. MTV’s largest annual event is also a prime opportunity for social engagement, which gives the camapign a chance to reach young people even if they don't watch the show. The VMAs tops out at about 10 million viewers in its best years, just 5% of the number of people who watched #CATmageddon. To capitalize on viral potential, Truth makes a point of enlisting YouTube and Vine celebrities as part of a socal push. Last year, singer Todrick Hall took a limo to the VMAs with the MTV moonman mascot in a Truth-branded video. This year, Vine star George Janko and YouTube star Macy Kate appear in the Squadless spot, though not as any of the smokers. But the greatest impact comes from the 93% of teens who don’t smoke, Koval said. "We call them our 'finishers.' Nothing is more powerful than a young person and their influence on their peers." Squadless will run through the end of the year. Upcoming spots are in the works, and will focus on other issues important to young people. "We know they care about relationships - that will always be an evergreen for us," Koval said. "We know they care about their finances, we know they care about social justice issues. They care about the environment, so those are the kinds of things you'll see us talking about."